"Delicious, subtle orange flavor highlights this old world favorite. Whether for holidays or if I need a ticket out of the doghouse, my wife loves these and eats 'em about as fast as I can make 'em. Don't be scared, blintzes are actually very easy to make. They fill the house with a unique baking/frying smell which shouts, Comfort food is on the way! I hope you enjoy these as much as we do." Mix 2 tablespoons of sugar, 1 teaspoon of orange zest, salt, and flour in a small bowl. Combine milk and yogurt in a separate bowl. Stir in olive oil and mix until smooth. Beat 4 eggs in a large bowl, then add orange juice. Stir in the yogurt mixture followed by the flour mixture. Beat until smooth. Allow batter to rest at room temperature for 1 hour. Beat 1 egg with 3 tablespoons of sugar, then add butter and cottage cheese, mixing until smooth. Stir in the bread crumbs and 1 tablespoon of orange zest. Refrigerate until the batter is ready. Lightly butter a 6 inch skillet, and heat over medium heat. For each crepe, pour 1/4 cup of the batter into the skillet, and immediately rotate the skillet until the batter evenly coats the bottom in a thin layer. Cook until the top of the crepe is no longer wet and the bottom has turned light brown. Run a spatula around the edge of the skillet to loosen; flip the crepe, and cook until the other side has turned light brown. Stack the crepes in a clean kitchen towel, placing waxed paper between each. Place 2 to 3 tablespoons of the filling onto the golden side of the crepe. Roll the crepe up and repeat until all the blintzes are made. Heat 2 tablespoons of butter in a large skillet and fry 4 to 5 blintzes at a time until golden brown, about 2 minutes on each side. 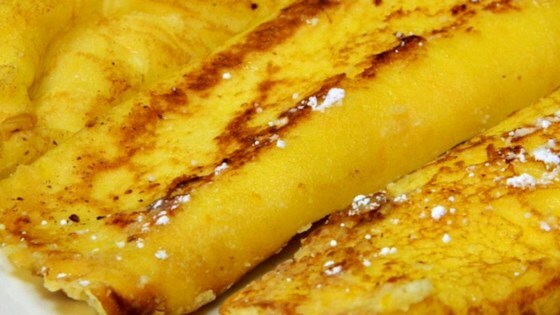 The ultimate French toast breakfast indulgence. I am going to try subbing matzah meal for the flour and bread crumbs. I love the texture of these blintzes. I must keep this recipe, because it's fabulous! All the more I can say is "Have Mercy!"